Fyodor I Ivanovich (Russian: Фёдор I Иванович) or Feodor I Ioannovich (Russian: Феодор I Иоаннович); 31 May 1557 – 16 January (NS) 1598), also known as Feodor the Bellringer, was the last Rurikid Tsar of Russia (1584–1598). 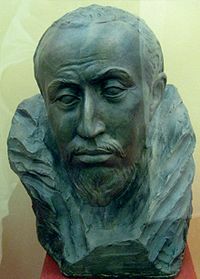 Feodor was born in Moscow, the son of Ivan IV (The Terrible) by his first wife Anastasia Romanovna. Although he was the sixth and youngest child of his mother, he grew up with only one older brother, Ivan, because all his other older siblings died before Feodor was one year old. His mother also died by the time Feodor was three years old, and her death greatly affected his father, who had been very attached to his wife. Ivan the Terrible began to earn his sobriquet 'the terrible' during the years of Feodor's childhood. He also took a series of other wives, but Feodor's only surviving half-sibling, Dmitry of Uglich, was fully twenty-five years younger than him. Feodor was only the nominal ruler: his wife's brother and trusted minister Boris Godunov legitimized himself, after Ivan IV's death, as a de facto regent for the weak and disabled Feodor. Feodor's failure to sire other children brought an end to the centuries-old central branch of the Rurik dynasty (although many princes of later times are descendants of Rurik as well). Feodor was succeeded as tsar by Godunov. The termination of the dynasty can also be considered to be one of the reasons for the Time of Troubles. [verification needed] He died in Moscow and was buried at Archangel Cathedral, Kremlin. ^ Great Synaxaristes: (in Greek) Ὁ Ἅγιος Θεόδωρος ὁ Πρίγκιπας. 7 Ιανουαρίου. ΜΕΓΑΣ ΣΥΝΑΞΑΡΙΣΤΗΣ. ^ Chisholm, Hugh, ed. (1911). "Theodore (tsars)" . Encyclopædia Britannica. 26 (11th ed.). Cambridge University Press. ^ Martin Banham, The Cambridge Guide to Theatre. Cambridge: Cambridge UP, 1998. p.1115. ISBN 0-521-43437-8. ^ See Hume, David (1983). The History of England from the Invasion of Julius Caesar to the Revolution of 1688. IV (1778 ed.). Indianopolis, IN: LibertyClassics. p. 376 – via Online Library of Liberty.